The recent methane findings “confront us with robust data that demand interpretation,” a team of international scientists wrote in a study published last week in Astrobiology. The study authors have done just that — they sorted out what measurements, experiments, and missions NASA and other space organizations should prioritize as they seek more evidence that Mars does (or did) support life. 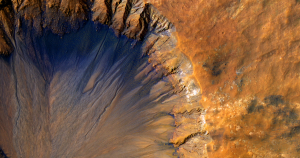 In short, the scientists want to study Mars’ geological activity. They want to understand the relationship between these newly discovered organic compounds and the fluctuating methane in the atmosphere. Their goal is to find traces of other molecules and gases that might make it possible for some primitive, microscopic life forms to survive beneath the planet’s surface. Here’s what exactly they’re looking for. When we eat, our bodies pull energy out of our food through chemical reactions that create a back and forth flow of electrons and oxygen atoms between molecules. This back and forth is necessary for fueling our bodies — all living things do it. But because of Mars’ extreme atmosphere, this balance doesn’t exist. The atmosphere is so strongly oxidizing that these reactions would only happen in one direction. Any living thing on Mars would be reacting so strongly with the air that it wouldn’t be able to survive. The researchers are looking for components in the Martian atmosphere that would balance out that reaction, which would make life possible. The next step towards understanding whether Mars could have ever hosted life, the researchers suggest, is to dig beneath the surface of Mars in order to figure out where all this methane is coming from. While living things on Earth produce methane as they digest food, that’s not the only way the gas could emerge in an atmosphere. NASA’s upcoming InSight mission will probe beneath the surface of Mars. It’s primarily geared towards learning about seismic activity, but who knows what it might discover along the way. Our best guess for why Mars’ methane levels fluctuate? The seasonal freezing and thawing of ice, which traps and releases methane over time (we know this from data from the Curiosity rove). But there’s no easy way to tell how long that methane has been there or whether more is being generated. And that means finding the source of Martian methane is more complex than pulling the finger of a little green alien. By examining the chemical composition of subterranean samples and taking more atmospheric measurements, scientists would be able to learn whether this methane came from biological processes or complex chemical reactions that don’t involve life at all. The researchers behind this plan aren’t suggesting it because there’s super compelling evidence that Mars supports life. In fact, as astrobiologist Caleb Scharf once asserted, it is far more reasonable to assume that it does not exist anywhere other than Earth. After all, that’s the only place we know for sure has got it. But if, by some fantastic chance, there are some microbes hiding under the planet’s surface, or if there used to be some form of life on Mars, the study authors’ strategy likely represents our best chance at finding it. The post Scientists Need to Solve These Two Mysteries to Find Life on Mars appeared first on Futurism.